Cheap Personalized Magnetic Alligator -Croc Clips Custom Printed in Bulk. Budget Prices in America. Bulk Magnetic Alligator Clips -Croc Clips, custom imprinted. 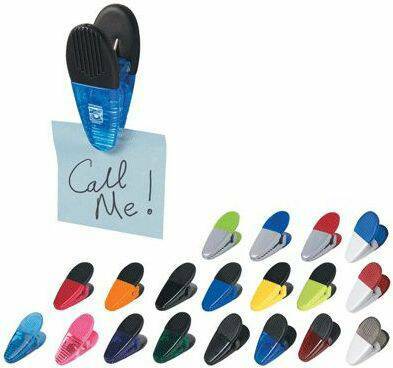 We also supply blank (not imprinted) Magnetic Croc Clips for $0.57 each (minimum 250). Lowest prices in USA and Canada for wholesale custom Magnetic Alligator Clips . Free artwork design. American clients pay no taxes. We will send you a proof for your approval before production. Unit prices below include your 1-color custom imprint. Add $0.25 for an additional color, per alligator clip. 2 colors maximum. SET UP CHARGE $40.00; $25.00 on re-orders. Production Time: 3 days after art approval. Blank (not custom imprinted) magnetic alligator clips ship next day. COLORS AVAILABLE Translucent: Red, Blue, Purple, Green or Charcoal, all with Black Rubber Grip. White with Translucent Red, Blue or Charcoal Rubber Grip. Translucent: Pink or Light Blue with Matching Rubber Grip. Solid: Red, Black, Blue, Yellow, Orange or Lime Green, all with Black Rubber Grip. Silver with Lime Green, Red or Blue Rubber Grip. PACKAGING Cello Bag, 250 per carton @ 29 lbs.